Well in 7th grade I was at Bishop Foley’s open house, looking at all of the different clubs and teams and whatnot that the school had to offer. The robotics team was doing a demonstration and I knew that was what I wanted to do during high school. So in 2007, my freshman year, I joined the team. Back then there were only ten or eleven kids on the team and we only had a few mentors, none of whom were particularly organized. None of the freshman ever knew when there were actually meetings, so when build season rolled around none of us had any real knowledge of, well, anything. But that was when the fun began. I have never learned more than I learned in that first build season, the mentors and older students were absolutely fantastic in teaching all of us as the season progressed. After this I was hooked. Over the next few years I got more and more involved with the team, culminating in my election as team captain as a senior in 2010. 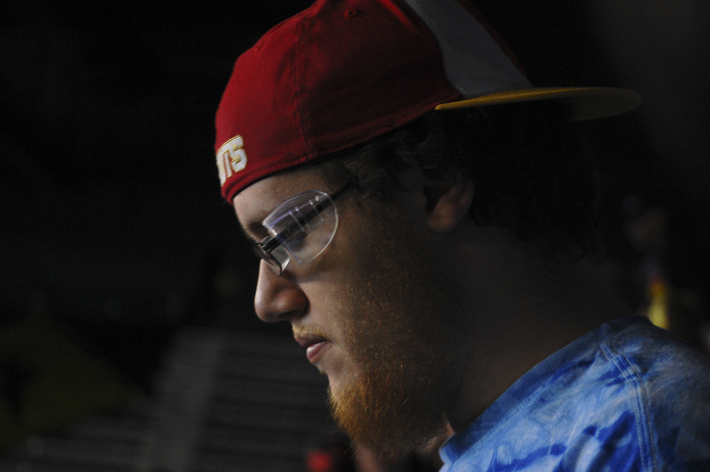 While I hate to do it, I’m going to be cliché and say that my involvement in FRC changed my life. I’ve had people question this statement, as my majors have absolutely nothing to do with STEM. History and English? What kind of FIRSTer picks those majors? But FIRST did lead me to choose those majors, albeit along an indirect route. As a senior I spent a lot of time tutoring the younger members of the team, helping them with their homework and the like. This is what made me realize that I loved teaching. While in college I decided on dual majoring in History and English because those were always my favorite subjects in school, and I’ve had some less than stellar teachers in both subjects that I know turned a lot of kids off to them. So my goal is to be able to show students that these subjects can be fun and interesting too, opening paths to kids that might not have otherwise seen that they exist. So, in my mind, this is similar to FIRST’s goal of expanding STEM, just in my case I’m focusing on other subject areas. Makes sense, right? Probably not. But that’s my story and I’m sticking to it. So my involvement in FIRST and Team 910 definitely changed my life, and this is why I haven’t been able to stay away. After graduation, I decided to take a year off from official involvement with the team in order to make sure that I could focus on my schoolwork. However since I knew that all Michigan teams are required/strongly encouraged to provide two volunteers for every district event, I decided to help out 910 by being one of those volunteers. On a whim, I signed up to be a referee, not expecting to be picked to be one. To my surprise I was asked to do it, and I refereed two districts that year. Including those two, I’ve now refereed at 28 events (19 official and 9 off season) in the past four years. While I can’t say this with 100% conviction, I believe that I was the most experienced Aerial Assist referee at the end of the season, with 7 events and over 750 matches refereed this season. So that’s kind of cool. In addition, beginning in 2012 I became 910’s Strategy and Scouting mentor and this past year I also began helping with Media and Award Submission. I love FIRST, I love what I do with team 910, I love volunteering, and I love watching my students grow into young adults. The “I” is my favorite letter in FIRST, as my goal every time I go into our build space is to inspire the students to reach their full potential. Currently my main job is as a student. I just graduated on May 1st, 2014 with my Bachelor’s Degree in English and History, and in the Fall I’m starting work on a Master of Arts in Teaching with a Secondary Education Certification (Kind of a mouthful, I know). Along with being a student I also work as a substitute teacher at Bishop Foley, which is kind of weird because I still have siblings that go there. That makes for some fun classes. I also work a lot with the Drama Department at Foley, my mom runs it so I’ve kind of gotten roped in over the years into doing more and more. I started out as one of the guys in charge of the sound board in high school and have now evolved into the co-producer of all of the shows we put on, which pretty much means I do the paperwork my mom doesn’t want to do. Finally, during the summer I work as a camp counselor at Camp Ozanam. Besides FIRST this is my favorite thing that I do. Camp Ozanam is run by the St. Vincent de Paul Society and is provided as a free camp for underprivileged kids that would otherwise be unable to come to a summer camp. The camp is on a beautiful piece of lakefront property in the thumb of Michigan, on Lake Huron, and I love spending my summers up there. Overall my end goal is to become a high school teacher of History and English. Oh there are so many…but there is one clear favorite. During my senior build season, my dad had a major stroke during Week 3. Like, “would have died if it hadn't happened just as he was getting off of his shift in the ER” major. As the second oldest of eight kids, this dumped a lot of responsibility on my lap as I tried my best to step up and help with whatever my mom needed so that she had time to go down to the hospital to visit him. As can be imagined, this began to cut into my robotics time. However my teammates and the mentors were completely understanding, doing whatever they could to cover my responsibilities when I couldn't be there. Various parents were constantly giving me food to bring home so my mom wouldn't have to cook, and every day before dinner the entire team would say a prayer for my dad to get better. This just solidified in my mind the importance of FIRST and the power it had as an organization. These people weren't just my team, they were my second family. Without the support of everyone I don’t know if I would have been able to finish out the season. A few weeks later at the Kettering District Event during Week 1, our lead scout had a breakdown and was unable to keep scouting organized. 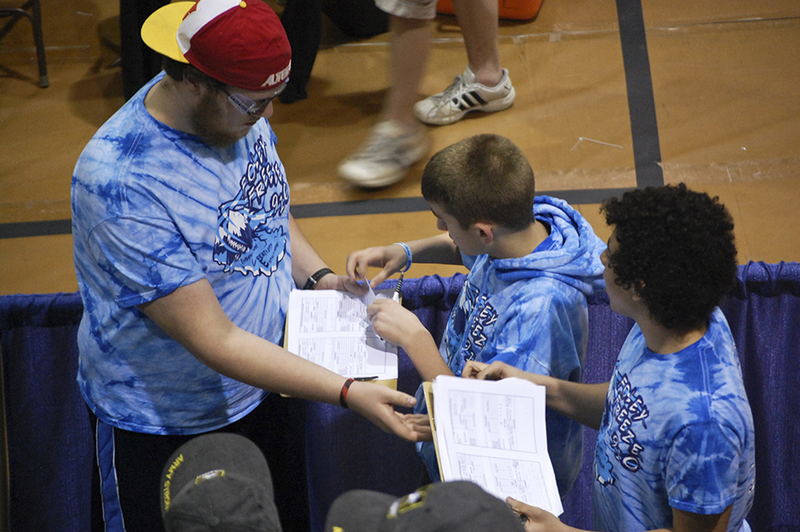 As captain I stepped up, knowing this was what my team needed and what my dad would want me to do, and during the first few qualification matches I completely redid our scouting system and started organizing the rest of my team in order to try to get some semblance of data. This turned out to be necessary, as at the end of the day on Friday we were ranked number one. We ended qualifications on Saturday ranked 2nd and we were picked by the number one seed, Team 67 the HOT team, and together we picked Team 70, More Martians, as our third robot. After some tough elimination matches we ended up winning the district, which was the first official event win for 910 in team history. As one can probably imagine, the entire team freaked out and there was screaming and hugging and crying and it was amazing; I’ll never forget that feeling. The next day I went with my mom down to the hospital to visit my dad and brought him one of the medals because, while he didn't know it, he was my inspiration at that event and I used my personal inspiration as fuel to motivate the rest of the team. I would be a liar if I said there weren't any tears in the hospital room that day. Just like everyone else who’s been featured in this blog, I have to say this is probably the hardest question to answer. I have a great respect for the robots built by all of the “greats,” so it’s really hard to pick just one robot. So I’m going to cheat and list a few. · 469 in 2010: Just such a dominant robot, and not just because of the redirection. The fact that at an off-season event (MARC, I believe) they took that entire structure off and were still one of the best robots there was astounding. · 67 in 2012: I loved HOT’s utility, do-everything magic arm. This was my personal favorite HOTbot, it was just amazing to watch play. · 33 in 2013: It was an adorable little vacuum bot! How can you not love it? · 1986 in 2014: While I didn’t see it play as much as I would have liked too, I just really liked the overall look of Tusk. 1986’s robots of the last few years have all been very nice looking, and they’re one of the teams that I look to for inspiration. · 254 in 2014: That 3-ball auton though. I had the honor of refereeing on Curie this year, and watching this robot’s run to Einstein through some very tough competition was amazing to watch. FRC Spyder, I’m constantly updating it and following all of the teams that are competing in a given week. My FRC Manual App is also frequently opened, as it’s a super convenient way to look up and search rules while reffing. I use Microsoft Excel a lot to create scouting sheets and do some simple analysis of teams during our Friday Night Scouting Meetings. But my number one and two robotics tools are a legal pad and a pencil, as any of my scouts can tell you. There’s just something about taking notes on one of those yellow pads of paper that I just can’t do without, even as technology advances around me. I don’t really have a fancy workplace setup, it’s just wherever I happen to have my laptop and phone. I’m a simple guy with simple needs, all that I require is a table with a little space and I’ll make it work. I generally just have Pandora running in the background almost all the time, but what I listen to depends on what I’m doing. I love classic rock, Queen is my go to band when I’m doing scouting analysis work. While I do research for school I’ve learned that Flogging Molly and the Dropkick Murphys go perfectly with historical research, while Disney music keeps me while I’m doing research on literature (don’t judge me). I’m also a huge fan of third wave ska, Streetlight Manifesto and Reel Big Fish are two of my favorite bands in that genre. During build season 910 meets Monday through Friday from 6 to 9 and Saturday from 10 to 4. Personally, I only come two or three times a week depending on what kinds of projects my students are working on. I’m there more frequently as the end of build season approaches, as that is usually when I have time to sit down with some students and work on developing our scouting system for the year’s game. Reaching shelves that are high off of the ground (I’m 6’ 8”). Besides that, I’m pretty good at remembering robotics names and team numbers and what their robots looked like in various year, it comes from having watched a lot of matches over the past eight seasons. The best advice I’ve ever gotten has come from my mom, but it’s really hard to pick just one thing that she’s told me over the years as the “best.” But one of the more impactful things she’s always told me is that it doesn’t matter what you do with your life, as long as you’re happy. One of my favorite quotes of hers is “I don’t care if you grow up and become a garbage man, as long as you’re the best garbage man you can be and you go home at the end of the day happy.” This had a large impact on my decision to become a teacher, because even though I won’t be getting rich anytime soon, it’s what I love to do. Netflix. When I’m in a bad mood or just burnt out after the robotics season or finals week I’ll sit down and watch an entire season of a TV show in a day. In that same vein, another guilty pleasure of mine is doing nothing. Sometimes I just need to sit down and not do anything for a day. I’ll go up to my family’s cottage on Lake Huron by myself and just relax on the deck. It’s horribly unproductive and I’m sure there are much better things I could be doing but it’s fantastic to just have no responsibilities every once in a great while. P.J. stands for Philip Jr. I know you were wondering.